Tags: Microphones in home recording, Vocal recording and mixing techniques. 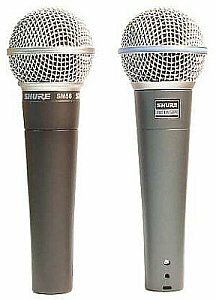 If Shure SM58 is a legendary dynamic microphone, it is OK to use them for recording vocals in my home studio? 1.) It is linearly/flat somewhere around 110Hz to 2500Hz. This implies that if the original vocals lie within this frequency range, it is neither boosted nor cut by the microphone behavior. The microphone does not add any EQ coloration at this frequency range. 2.) But if the vocal frequency is somewhat below 110Hz, the vocals’ frequency would be roll off (cut or attenuated) even if there is substantial bass presence in the vocals. 3.) Now for frequencies above 2500Hz until 10,000Hz, SM58 would gradually add a boost as shown in the frequency response peaking at +5dB somewhere between 5000Hz and 10,000Hz. 4.) It adds a very slight boost above 10,000Hz but not significant above 15,000Hz. 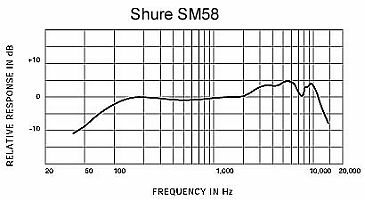 What does SM58 Frequency Response Implies in terms of Recording? 1.) 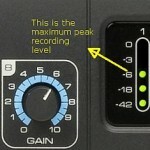 Most vocals during the audio mixing process will be roll off (applied with low shelf) below 100Hz. This is the practice of most vocals recorded using condenser microphones. However since SM 58 naturally rolls off below 100Hz as shown in its frequency response; you do not need to apply this EQ anymore. 2.) In addition, vocal presence strongly lies in the 2000Hz to 5000Hz, according to the frequency response; it is naturally boosted so you won’t be any more EQ’ing the vocals to improve its presence. It naturally comes with SM58.